Drawing inspiration from the hair style trends of our favorite stars and celebrities has become a national past time. 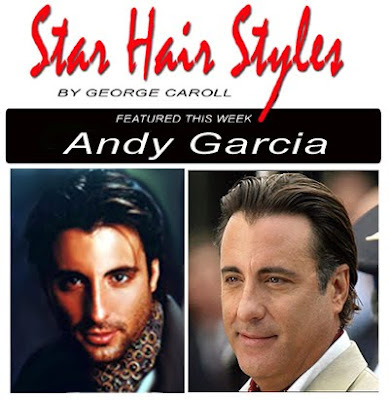 One such star whose hairstyle is emulated by stylish men around the world is Cuban born movie star Andy Garcia. His movie star good looks and stylish persona is irresistible to women attached to the creative types. TO GET THE LOOK: Are you looking for movie star style that’s sure to blow the competition away? If that’s the case, try Andy Garcia hair style on for size and watch the ladies heads turn when you show up looking drop dead handsome. Andy’s style comes with all the “bells and whistles” to make your pick up lines irresistible to women that go for the stylish types. To get the look, let’s take it one step at a time; starting with a style cut and shaping. LET’S SHAPE IT: To get the look, start with a close contoured silhouette, close tapered sideburns and neckline stylishly over the collar. The crown and sides a bit longer to brush back with or without a part. This stylish look is perfectly suited for straight hair and most faces shapes, especially those with angular facial features like Andy’s. With a few adjustments (trims) as it grows you can find the ideal length and shape for your style. LET’S STYLE IT: For style support start with a dab of shaping gel or styling mousse or nothing at all. 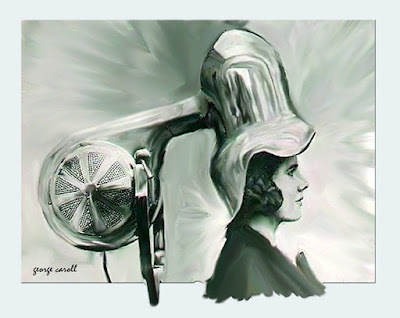 Just run either through damp hair and comb in place to dry au natural or give it a quick once over with a blow dryer for a full look. To turn up the shine, when dry, finger comb a dab of foaming pomade or styling cream through the sides and top. LET'S ADD SIDEBURNS, WHISKERS AND ACCESSORIES: Nothing can reshape a face or add a dramatic look like facial hair. Sideburns or a close clipped beard can make large ears appear smaller or a narrow face wider and definitely adds a stylish or artsy look. Include whiskers and topped it off with a silk neck scarf or white shirt and tie paired with a Giorgio Armani blazer, blue jeans, sunglasses and you've got the look. NOW, LET’S COLOR IT: Movie actors change their hair color often for the many roles they play so dying their hair is no big deal. If your natural hair color has lost its deep rich hue or graying around the edge, a dark brown tint (almost black) will define the shape and wash the gray away. After, a clear glaze seals-in the color and turns on the shine. To keep it up the new growth is colored every 4-6 weeks. This extra step will cost a few bucks but it’s a small price to pay for a youthful stylish look and all the attention you'll get. Andy's movie star style comes with all the "bells & whistles" to stop women dead in their tracks and make your pick up lines irresistible. The contoured swept back silhouette with close tapered sides and neckline stylishly over the collar pushes the style bar up a notch. A rich hair color has defined the shape, thickened the hair and swiped the gray away. Mid length sideburns or whiskers, stylish neck scarf, Armani blazer and Hollywood sun glasses gives you a cool casual look and pushes the "style bar to the max". Your buddies will be green with envy when they see all the babes making a fuss over you and your movie star style.